It is already a tradition for Peter Leko to take on strong contenders in rapid matches in Miskolc. It all started against Adams in 2005, then it was Karpov in 2006, Kramnik in 2007, and Carlsen in 2008. This year Leko is going to play against the World Champion Vishwanathan Anand. The event will take place in the National Theatre of Miskolc 2nd-7th June 2009. It will consist of 8 rapid games. Every day the players will give press conferences and there will be several public events as well. Every year Leko is taking on the biggest challenge in Miskolc. This year it is the 15th world champions of chess, the 39 year-old Viswanathan Anand. In 1987, Anand became youth world champion, in 1988 International Grandmaster. In 1995 he played PCA World Championship Final against Garry Kasparov, but was defeated by 10,5-7,5. In 1998 he encountered for the World Champion title against Anatoly Karpov but after 3-3, he lost in the rapid play-off. In 2000, he overcame Aleksei Shirov with a strong performance of 3,5-0,5 in the FIDE World Championship Final. In 2007, in the World Championship in Mexico he remained unbeaten during the whole tournament and vanquished the World Champion title from Vladimir Kramnik. He is currently at the top of his career, he defended his title against Kramnik in Bonn with a triumph of 6,5-4,5. Péter Lékó and Viswanathan Anand played against each other for the first time in a blitz game in 1994 and, since then, they competed in 72 games. They played classical, rapid, blind and blitz games, respectively. Anand is leading by 21-7, 45 games were draws. In rapid games the Indian world champion won seven times, lost three times and ten games were draws. The 2009 match Anand – Leko in Miskolc will consist of 8 rapid games of 25 min + 10 sec increment. In case of a draw 4-4, blitz games will decide the champion. The history of Miskolc – the descendants of the ancient settlement, formed at the foot of the Avas Hill, along the two brooks called Szinva and Pece flowing into the river Sajó- can be traced back to paleoanthrophic cultures. The Szeleta Cave nearby Lillafüred and other caves in the Bükk Mountains have preserved lots of memories for the posterity. At the top of the Avas Hill Neolithic tools were found. The region was gradually populated during this period over 10,000 years ago. Finds of grinding implements and the richly ornamented ceramics in the Bükk Mountains are 5,000 years old. The finds coming from the area of the today’s Iron Works refer to a more developed way of life during the Bronze Age. The first dwellers known in the Miskolc region at the end of the Iron Age were the Cotinus at the end of the Iron Age, one of the Celts’ tribes. This area was settled by the Ancient Hungarians over a thousand years ago and the settlement was named after the Miskóc clan. The settlement became the centre of the region from the beginning of 11th century. A work by Anonymus (ca.1210) mentions the dwelling place of the Bors-Miskóc clan at the time of the Magyar conquest as terra Miskoucy. This clan founded a St. Benedictine abbey in Tapolca Valley but the Tartars burnt down the settlement in 1241. The Bors-Miskóc clan lost their power in 1312 when they stood against Róbert Károly, whose intention was to break the feudal anarchy. The clan of Miskóc was followed by the Széchy family who laid the foundations of urbanization. They managed to obtain the rights to hold countrywide fairs and exercise minor jurisdiction, due the former village developing into a market town. At the end of 1364 Lajos I. 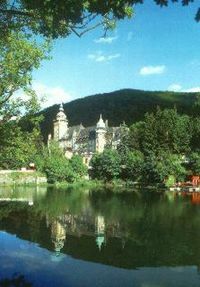 (the Great) annexed the town of Miskolc to the Diósgyor Royal Estate. The 13th century Diósgyor Royal Castle, accomplished and magnificently developed in the 15th century, became the centre of the Royal Estate. By the end of the 15th century the townscape had changed a lot and the origins of today’s town centre were gradually developing at the foot of the Avas Hill. The first wave of Turkish war reached the town in 1544. The most beautiful buildings fell prey to the first attack of pasha of Buda. The Turks also carried off all the able-bodied and wealthy men and drove away all their animals. With the fall of Eger Miskolc joined to the taxpayers of the Turks in 1596. Before chasing the Turks out of the country the Kuruc troops (Hungarian insurrectionists) had taken possession of the Diósgyor Castle in 1674 but it was only in 1687 that Miskolc ceased to be taxpayer to the Turks. During the Rákóczi war of independence ( 1703-1711) the prince put his headquarters in Miskolc from 18th of January to 15th March in 1704. On 25th of September 1706 town was sacked and burnt by the imperial forces. The town council was formed on 1st January in 1707 and during two short years, with the patronage of the prince, the town of Miskolc was reconstructed. The most significant buildings of Miskolc were constructed during the great period of prosperity in the 18th century. All denominations started to build their own churches and schools and the present town hall and county hall were built. The rich landlords built mansions one after another: Dory-, Almássy-, Szathmáry-, and Király mansions. Characteristically of a town advancing towards the Enlightenment there was an active Masonic lodge in Miskolc around 1780 which kept in touch with the Hungarian Jacobin people as well. The first stone-built theatre of the country was built up here with the contribution of Miskolc citizens in 1823. After nearly all of the famous vineyards of Miskolc were devastated by the filoxera they were not replanted as the inhabitants now earned their living in industry and trade. Multi-storied houses built at this time gave an urban character to the town. They still can be seen in the streets. The town got municipal rights in 1907. The violence of the First World War did not reach the immediate area of the town but indirectly it damaged the inhabitants of the town. More than 5000 people fell victim to the cholera epidemic in the local military hospital and the cholera huts. Two new cemeteries had to be built: the Heroes’ cemetery at Tetemvár (Corpsecastle) and another cemetery for those who died of cholera situated beyond the Sajó river. Following the First World War a decline occurred in the regime’s economy. This situation was made worse by influx of Hungarian refugees arriving from the newly detached parts of the country. During the 2nd World War the town first experienced an air attack on 2nd June 1944. For the inhabitants of Miskolc the war came to an end on 3rd December with the arrival of the Soviet Red Army. Miskolc suffered massively because of the war: 350 houses were destroyed; 7150 damaged and all the bridges were blown up due to the air raids. Wooden headboards were erected in memory of the victims of the 2nd World War in the Szemere-garden. The town was rebuilt rapidly and became one of the industrial centres of the region. Consequently, huge factories and housing estates were built and the University of Technical Sciences was established here in 1949. The number of inhabitants increased significantly due to the industrial developments of the 1960-70′s and therefore huge housing estates were built in different parts of the town such as Kilián and Szentpéteri kapu. Besides these the Avas housing estate was built where more than 35 thousands people live at present. The vast reconstruction of the town centre began in the middle of the 1980′s and it is still going on. The principal street of the town called Széchenyi Street was repaved as a part of this redevelopment. The 100 year-old tram network is also being renovated. The commercial life of the city is now growing rapidly. Miskolc in the 90′s is a dynamic town developing and changing with the new times.